This page is devoted to the Earth's water cycle and its influence on the Earth's heat budget and natural climate. The scientific term for water is hydro, from the Greek root word for water. All of the water stored in our fresh and salt waters in all of its forms or phases is called the Earth's hydrosphere. Those fresh waters originate with rain and snow falls over land with water evaporated primarily from our salt water oceans by the sun during the day and from stored heat at night. ﻿You experience the influence of the Earth's water cycle on the Earth's heat budget when you compare the difference of the nightime low temperature just above the land's surface between a humid, cloudy night sky and a dry, cloudless night sky at the same time of year. 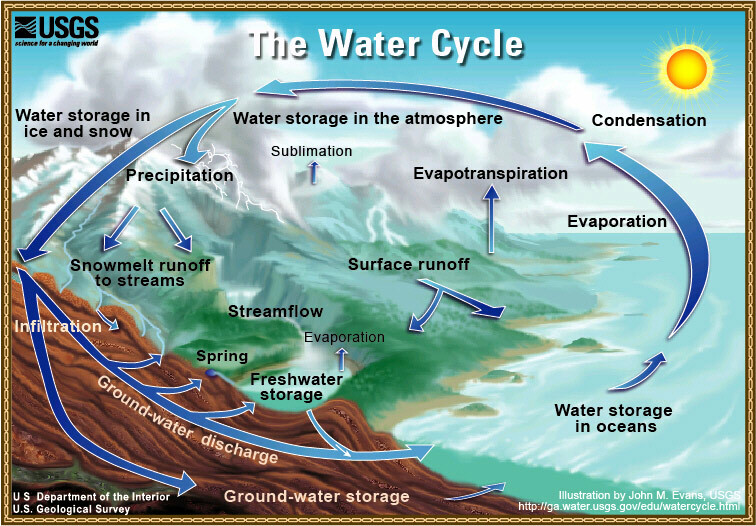 The scientific term for the Earth's water cycle is the hydrological cycle. The Earth's hydrosphere interacts with the layers of air in the Earth's atmosphere and the layers of land in the Earth's lithosphere by exchanging water and thermal energy within the hydrosphere and between the hydrosphere and atmosphere, the atmopshere and the lithosphere, and the lithosphere and the hydrosphere. To be waterwise we need to apply our understanding of the Earth's water cycle to careful planning so that we can strike the right balance between the natural rate of supply and the unnatural demands humans place on the quantity and quality of our large but finite standing and flowing fresh water resources. Here are links to excellent references and websites on the Earth's Hydrological Cycle. 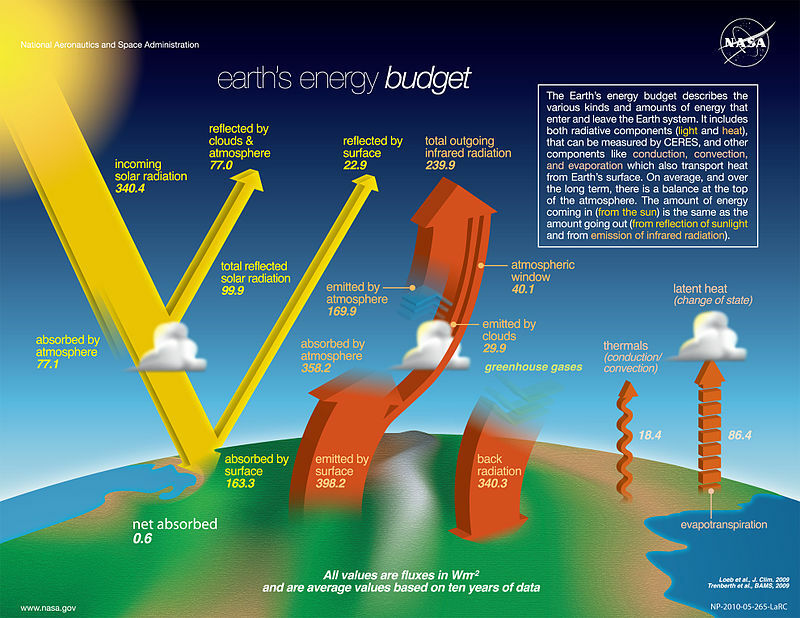 ﻿Here are links to excellent references and websites on the interaction between the Earth's Hydrological Cycle, the Earth's thermal energy budget, and the Earth's natural and human-altered Climate Cycle. The scientific term for heat is thermal energy from the Greek root word for heat, thermo. The specific heat of a substance, the amount of thermal energy required to raise on gram one degree Celsius, is a fundamental property of all matter, whether in the form of a pure element or compound, and irrespective of its phase as a plasma, gas, liquid, or solid. The heat capacity of matter in bulk is calculated by multiplying the specific heat by its mass. The thermal energy or heat content of bulk matter is calculated by multiplying its heat capacity by its temperature above absolute zero in degrees Kelvin, where 0 degrees Celsius is +273.15 degrees Kelvin and 0 degrees Kelvin is -273.15 degrees Celsius. The gain or loss in thermal energy of bulk matter is calculated by multiplying the heat capacity of bulk matter by its change in temperature. 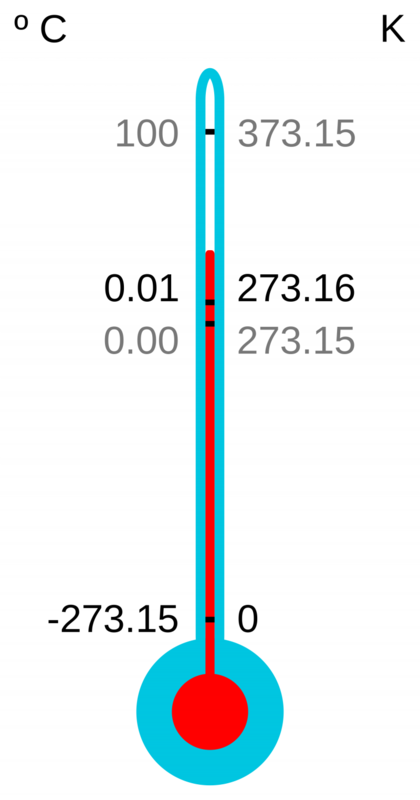 ﻿ Because thermal energy, like all energy, is conserved in all real-world processes, thermal energy lost from one reservoir must be transferred to and reappear somewhere else inside the boundaries of the system in another reservoir or be lost across the boundaries of the system by radiation, conduction, and/or convection. The science of thermodynamics is the study of the useful work that can be done from the movement of thermal energy from a hotter to a colder reservoir until no more work can be done when the two reservoirs are at the same temperature at thermal equilibrium. This is also true of chemical work at chemical equilibrium.